Here is a way to get one to two servings of healthy greens for breakfast on your way to 52 Weeks of Health. I make a pan of this in the evening and reheat squares of it for the two of us in the morning. One recipe lasts us four days, so I can get a great start on my veggie load for the day with minimal effort. The best part is you can vary the recipe – change the type of cheese, add your favorite spices, add a little meat or some different veggies. I’ve added mushrooms sometimes. If your family hasn’t developed a love for spinach and/or broccoli yet, start with less of those and gradually increase the amounts over time. Increase the cheese, add bacon, or whatever will help them develop a taste for the vegetables. Grease an 8 x 13 pan with butter, coconut oil, or olive oil. Preheat oven to 350 degrees. In large bowl, beat eggs until smooth. Add in half and half and beat on low just until incorporated into the eggs. Stir all of the other ingredients into the egg mixture. Pour into the prepared pan. Bake for about 35 minutes. Quiche is done when a knife inserted in the middle comes out clean. Makes 8 healthy servings. Note: please don’t use egg beaters or similar products! Eggs are not the evil things that they have been made out to be. The yoke is full of nourishing goodness that will not raise your cholesterol. Note: I actually use light cream. Because of my husband’s diabetes we eat a very low-carb diet, and cream has little to no carbs. By cutting out virtually all carbs except for those in low-starch vegetables we really don’t worry about quantity of fat (although are picky about the quality). Both of us have lost weight eating this way. If you are not yet convinced of this feel free to use milk instead of half and half or cream. Serve this with a serving of fresh fruit. If you must have some bread, make it a small helping. 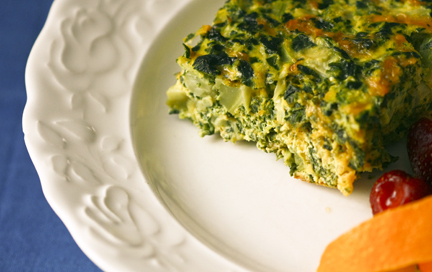 The protein and fat in the quiche should carry you to lunch with plenty of energy. Share your variations in the comment section, please. Happy vegetable eating! Looks yummy RoseAnne. Thanks for your inspiration. I’m ready to get started!! Yay, Sue. Focus on eating healthy foods and eventually the unhealthy ones will lose some of their appeal. Thanks for the recipe, Roseanne! I am going to try and make it today! You’re welcome, Jen! I’m glad you liked it.